Where is the best place to store beans? If you are not going to eat them immediately, you can do worse than to get them sprouting and then store them in the ground for a season! 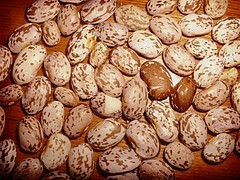 We did that with some dried pinto beans earlier this year, which had a surprisingly good germination rate. A few months further on and we have harvested a lot more than we planted, giving a good return on investment (and the inspiration for another photo!). You can click on the image to see it full-size in my Flickr account and you will also find another, monochrome version of the same shot.